The 2017 Saratoga Showcase of Homes Committee is proud to announce a spectacular line-up of 14 of our region’s finest builders for the area’s premiere new home tour event. Celebrating 22 years of exceptional homes, this annual fall tradition will once again run over three beautiful weekends this September 16-17, 23-24 and 30-October 1. The award winning builders committed to this year’s event are; Abele Builders, Bella Home Builders, Belmonte Builders, Bonacio Construction, Herbinger Homes, Heritage Custom Builders, La Femme Home Builders, Marini Homes, McPadden Builders, Pigliavento Builders, R.J. Taylor Builders, Saratoga Builders, Whitbeck Construction and Witt Construction. This year will have a total of 18 new home locations on display in Saratoga County. Tickets to visit all these homes will still only be $20. Special “Taste of Showcase” Preview On Friday, September 15! A special “Taste of Showcase” preview is scheduled for Friday, September 15 from 5:00PM–10:00PM featuring food samplings from area chefs along with local beer and wine tastings. A limited number of tickets for this evening will be available and more information about this event regarding location and ticket prices will be announced at a later date. Experience “If You Build It, They Will Come” at the Showcase of Homes This Fall! The Showcase committee has an extensive marketing and promotional campaign in development which includes official media sponsors in print including newspapers & magazines, online, television, billboards and social media. Corporate sponsorships are now available to support this annual event. 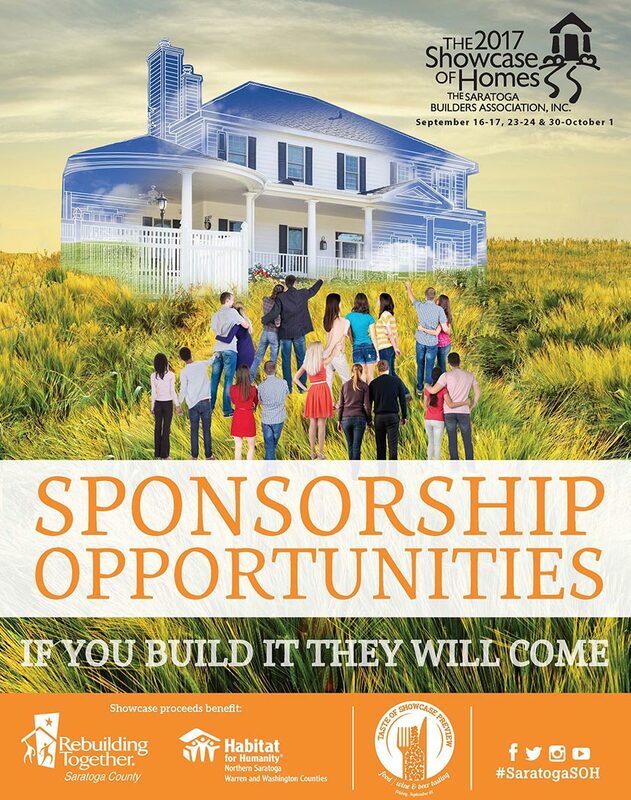 For a detailed sponsorship opportunities packet, please contact Barry Potoker at (518) 366-0946 or via email at bpotoker@saratogabuilders.org. Over the past 21 years, this community event has contributed over ONE MILLION dollars to our two local charities. Proceeds from the Showcase of Homes benefit Rebuilding Together Saratoga County www.rebuildingtogethersaratoga.org and Habitat for Humanity of Northern Saratoga, Warren and Washington Counties www.glensfallshabitat.org. A total of $70,000 was raised last year. For more details on the 2017 Saratoga Showcase of Homes event, please visit www.saratogashowcaseofhomes.com. Follow us on FACEBOOK for all the updates!